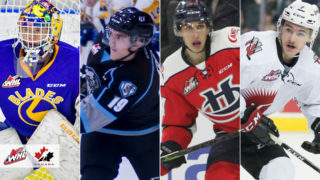 Saskatoon, SK – The Saskatoon Blades burst out of their offensive slump on Tuesday night, breaking through Matt Berlin and the Kootenay ICE for 5 goals, including a power-play, short-handed, and empty net goal en route to a 5-3 victory. 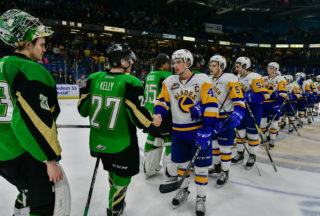 The Blades are now 26-25-2-1 on the year and have regained possession of the final wild-card spot in the Eastern Conference with 55 points ahead of Prince Albert’s 53. 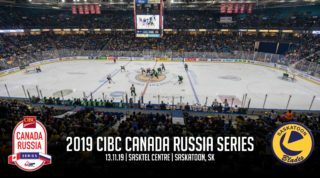 The Saskatoon Blades and Kootenay ICE entered Tuesday night’s tilt both looking to reverse their recent fortunes of two and three game losing streaks respectively. 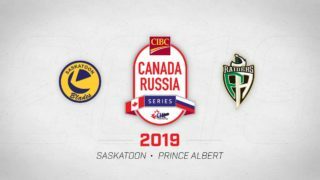 For the Blades, a win would mean leap-frogging ahead of the team they’re chasing in the standings, the Prince Albert Raiders. Kootenay, on the other hand, needed a win to reaffirm their control of the third Central Division playoff position. The first period proved to be a tight-knit and even affair. Saskatoon and Kootenay swapped power play opportunities, took 8-shots-a-piece and finished the first 20 minutes scoreless. Saskatoon wasted little time in the second period before taking the game’s first lead of the night. After killing off carryover time from a penalty in the first, the Blades earned a power play chance of their own. Passing along the point, Dawson Davidson fed Max Gerlach the puck which Gerlach then released low, goal-ward bound. Along the way, the puck met Michael Farren who was out in front of the ICE’s goaltender and tipped Gerlach’s shot in through the five-hole for his fifth goal of the season. The ICE responded with a goal of their own however, scoring at 14:23 through Colton Kroeker whose light shot slithered it’s way underneath piling bodies in front of Nolan Maier’s crease and found the back of the net to tie the game 1-1. Naturally, Farren was not impressed and struck again to give the Blades their lead back at 2-1. Another pair of defenders, this time Evan Fiala and Mark Rubinchik, joined forces to give Farren his second of the game and sixth of the season. Rubinchik fired off a backhand shot while driving through the slot which Farren redirected out of mid-air and past ICE netminder, Matt Berlin. Saskatoon then made their lead over the ICE 3-1, scoring short handed on a subsequent Farren penalty. On the penalty kill, Jackson Caller sprung Kirby Dach on a 1-on-1 opportunity the other way. Dach cut to the middle from the left wing and got a low shot on goal, forcing Kootenay’s goalie to make an awkward save. From there, Brad Goethals swept in and scored his 10th goal of the season from the rebound at 5:47. Just over 5 minutes into the third period and a misplay by the Kootenay ICE in their offensive zone gifted Max Gerlach a breakaway. 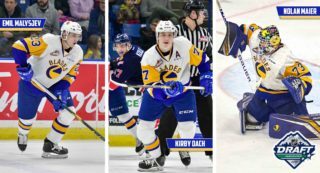 Going in alone against the ICE’s tendie, Gerlach calmly picked his favourite spot before sniping in his 25th goal of the season into the top right corner and setting the score at 4-1 Blades. Gerlach, top cheddar. That's his 25th. Kootenay wasn’t going away easily though, and added a couple late goals from Colton Veloso and Peyton Krebs making it a one goal game with 1:54 left on the clock. Then with the net empty and an extra attacker on the ice, Josh Paterson forced a turnover and found Chase Wouters in the slot who back-handed his 15th of the season into the empty cage to seal the deal with 54 seconds left. The Blades finished the night 1/3 on the man advantage while going a perfect 3/3 on the penalty kill with one short-handed goal. Nolan Maier earned his 17th win of his rookie season making 21 saves on 24 shots faced.